Pharmaceutical Product Development (PPD), a local major employer of VCU students from the sciences, is hosting an Open House and Information Session with their PPD Labs teams at their Richmond Lab (2244 Dabney Road, Building D, Richmond, VA 23230). The event is on Thursday, November 8th from 4pm – 7pm. This is a phenomenal opportunity for students to learn more about PPD and an opportunity to network. In fact, students attending the Open House are HIGHLY encouraged to bring multiples copies of their resumes to discuss with the lab members at the event. PPD is open to new/recent grads and upcoming Dec. grads as well as alumni. PPD also have a great technical training program in place for folks coming out of a BS in the lab sciences, so this is also a great info session for those still a year or two from graduating! Moreover, PPD are currently hiring for roles in all levels for the bioanalytical labs (BS, MS and PhD + alum are all welcome). Specific skills/majors where we have current openings are in vaccine sciences, immunochemistry, molecular genomics/PCR Sequencing (sr level roles in Molec/PCR as well) and biomarker sciences, so some majors and coursework well aligned are biochemistry, biology, immunology, chemistry, microbiology, cell biology, molecular biology and other related lab science degrees. ScribeAmerica is now hiring for a medical scribe position. Planning on going through the Pre-Health Advisory Committee process? Attend this workshop to learn how to be successful. Michael Donnenberg, M.D. is the Senior Associate Dean for Research and Research Training at the VCU School of Medicine and director of the VCU MD-PhD program. He is a physician, scientist, educator and administrator. Prior to coming to VCU he directed the MD-PhD program at the University of Maryland. His talk will focus on the physician scientist career path, describing what physician scientists do, how they train for their careers, and what undergraduates should do to decide whether to pursue this path and how to prepare to apply for MD-PhD programs. Increasingly, healthcare professional programs utilize the Multiple Mini Interview as a part of the admission process. A Multiple Mini Interview is like speed dating, but with a whole lot more on the line. You have five to ten minutes to impress your interviewer while you answer a question or respond to a scenario. The process repeats several more times until you have interviewed with eight to ten different people in under 90 minutes! During the workshop, Career Services will discuss MMI success strategies and then you’ll practice the MMI with Pre-Professional Health Advisors and faculty and staff. Pre-registration is required and space is limited to 50 participants. Professional dress is strongly recommend. 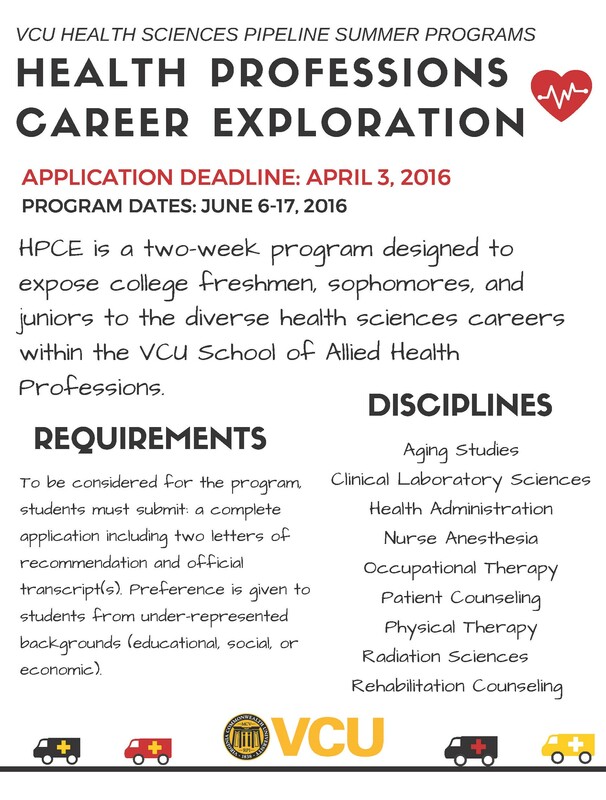 For more information, contact VCU Career Services at careers@vcu.edu or 804-828-1645. See links for pdf announcements and message below about new Ph.D. program in the VCU School of Dentistry. Well-qualified applicants will receive an offer of financial support which will includes a stipend commensurate with NIH guidelines and the payment of all applicable tuition and fees on behalf of the student. We are actively seeking applicants from VCU. Should you know of any students who may be interested in graduate research in one of these areas please share the attachments with them which include a little more information on the program or ask them to contact me at oloughran@vcu.edu.